Our mattress is probably the dirtiest item in our home that we can’t clean properly ourselves. All mattresses contain a thick cakey dust formed by dust mites (between two to ten million which are so tiny they are invisible to the naked eye), their skin and excrement, skin flakes that we shed which provides the mites with food, and perspiration that we loose overnight creating an ideal breeding ground. This dust contains harmful allergens given off through dust mite skin and excrement which can affect asthma and eczema sufferers (80% of asthma sufferers are allergic to these allergens), cause skin irritations and exacerbates sinusitis and rhinitis….that early morning sneezing when we get out of bed. 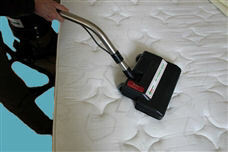 Using a domestic vacuum cleaner may remove a small amount of the dust from the surface but it cannot loosen and break up the debris throughout the mattress to enable the dust to be suctioned away. The Mattress Doctor® cleaning system will remove all this dust and contaminates leaving your mattress hygienically clean. We do not remove marks or stains. However, our UV Light removes the bacteria from the surface including the bacteria in marks or stains leaving your mattress fully sanitised. You can use the mattress ten minutes after the process is completed. It should be noted that water or steam should not be used to clean a mattress as the moisture will penetrate into the dust which acts like a sponge and will retain it, running the risk of fungi spores being formed. Chemicals too should not be used as the residue will linger and be inhaled which can cause additional health problems.